I spotted another Ag in Classroom sign on McCloskey Road. This one is for the Filice Farms. 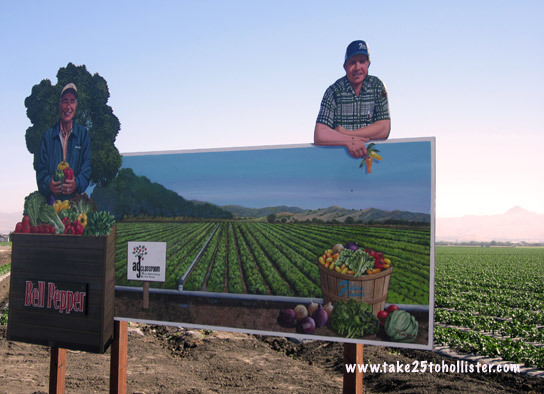 To see more signs that honor our local farmers, check this link. Today, I'm linking up at Monday Mural, hosted by Oakland Daily Photo. Click here to see what murals other bloggers around the world are sharing. Have you seen the Ag in Classroom sign of B & R Farms on Fairview Road? It lets you know what fruit is growing in the orchards there. The sign is one of several agricultural signs posted on farms and ranches throughout San Benito County. To see a few more signs, please click here. To learn more about the Ag in Classroom project, read "Farm Bureau Signs Celebrate Local Ag History" by Alexandria Triolo, which was published at BenitoLink.com. Today, I'm hanging out at Our World Tuesday. Please click here to check out what other bloggers from around the world are writing about their neck of the woods. Just after you pass Flynn Road while driving south on Highway 25, you can see the agricultural sign for Fairhaven Orchards on the right side of the highway. It's another sign put up by the Ag in the Classroom project sponsored by the San Benito County Farm Bureau. If you'd like to see a few others signs, check out this post. Fairhaven Orchards produces cherries and Blenheim apricots. 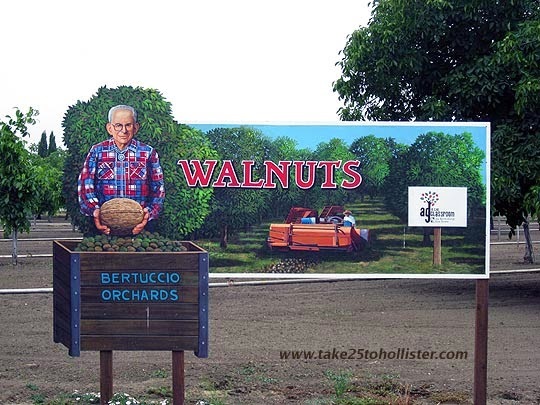 Located on Bolsa Road (aka Highway 25), the orchards have been owned and run by the Rajkovich Family since 1958. 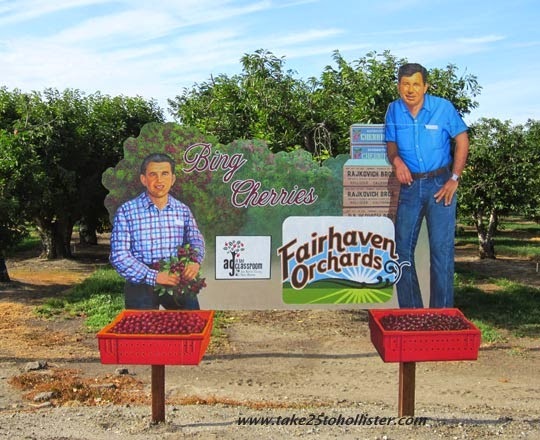 To learn more about Fairhaven Orchards, check out its website and Facebook page. 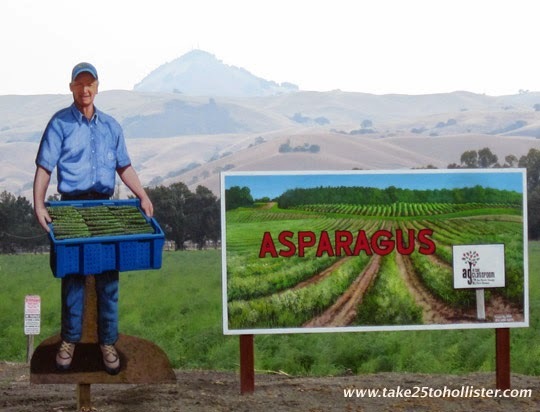 Back in January, I began noticing the beautiful agricultural signs popping up around San Benito County. They showcased both the products and the growers. The signs are part of Ag in the Classroom project sponsored by the San Benito County Farm Bureau. They deserve a big round of applause for their work! So far, I've taken photos of three of the agricultural signs. You can find this sign at the southwest corner of Union and Southside Roads. It's like a scavenger hunt for me. As I take photo of the different signs, I'll post them. To see the other two agricultural signs, click here and here. 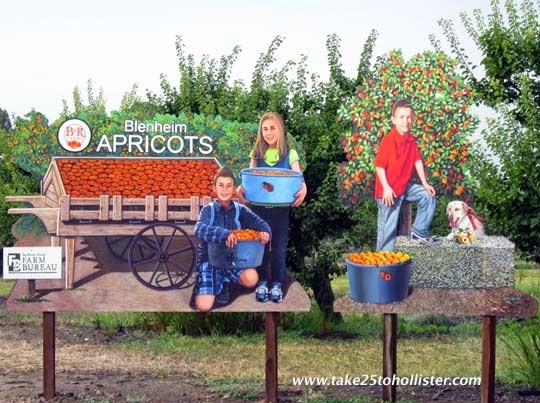 When I was a kid many years ago, Hollister was full of orchards of California Blenheim apricots, the most tastiest apricot around. Today, nearly all of those apricot orchards are gone and only a few local farmers continue to grow Blenheim apricots and produce dried apricots, apricot jam, apricot syrup, and other artisanal products. 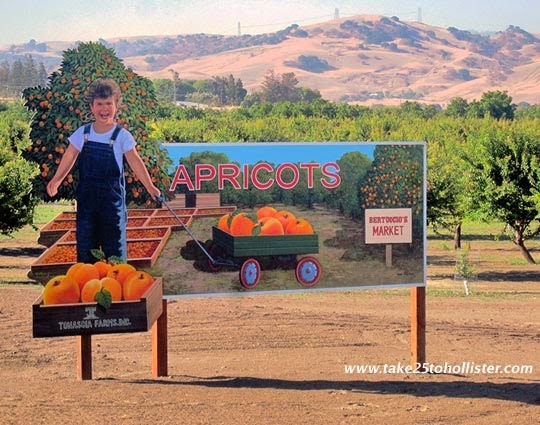 If you're searching for fresh Blenheim apricots, you might contact one of these businesses in Hollister. But, act quickly, the harvest season is almost over. Have you noticed this agricultural sign on the east side of the Highway 25 bend just north of Santa Ana Road? I've seen another sign in San Juan Valley. I hope more signs will be popping up throughout our county. A close up on the sign shows that it's from the Ag in the Classroom project sponsored by the San Benito County Farm Bureau.